Bootie LA: POP Goes the Diva! 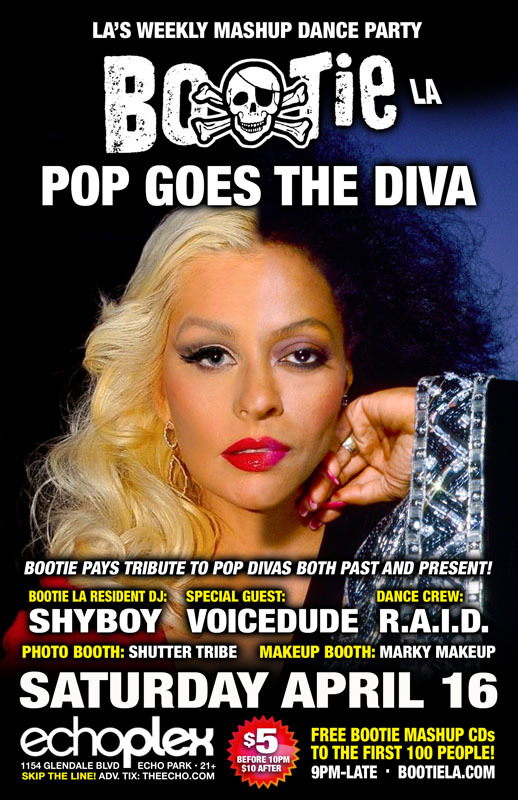 Los Angeles Bootie LA: POP Goes the Diva! Bootie pays tribute to the women who make pop music what it is – it’s Pop Goes the Diva! A night of all the greatest pop divas in history, getting mashed up with anybody and everybody! Only $5 before 10 PM! Bootie pays tribute to pop divas both past and present! Resident DJ ShyBoy and special guest Voicedude pay tribute to the women who make pop music what it is – it’s Pop Goes the Diva! A night of all the greatest pop divas in history, getting mashed up with anybody and everybody! Resident dance crew R.A.I.D. channels divalicious go-go insanity, Marky Makeup gives you a touch of diva, and Shutter Tribe captures it all! Plus FREE Bootie mashup CDs to the first 100 people through the door!